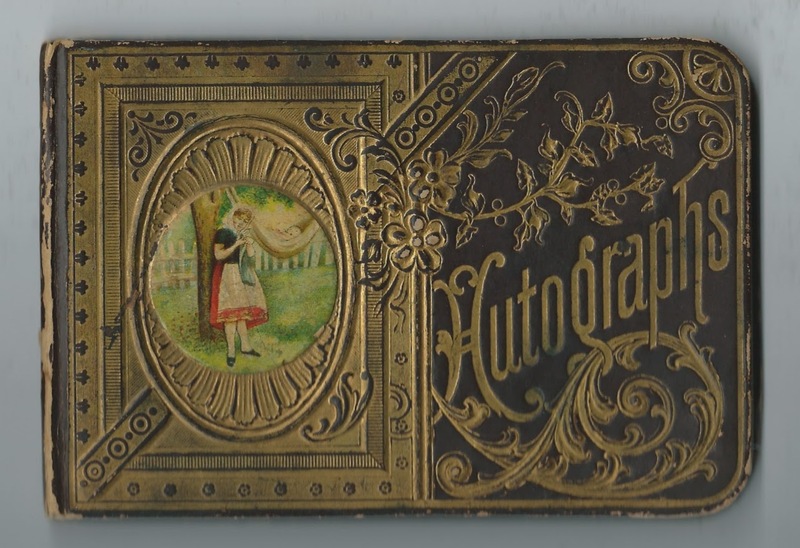 1890-1893 autograph album of Alma Betsy Vandy of North Cohocton, New York. According to an obituary of her father, her name may have originally been Vanderwarakin, according to his death notice, or Vander Workin, according to an online family tree. Alma received the album as a birthday present from her mother on April 20, 1890. 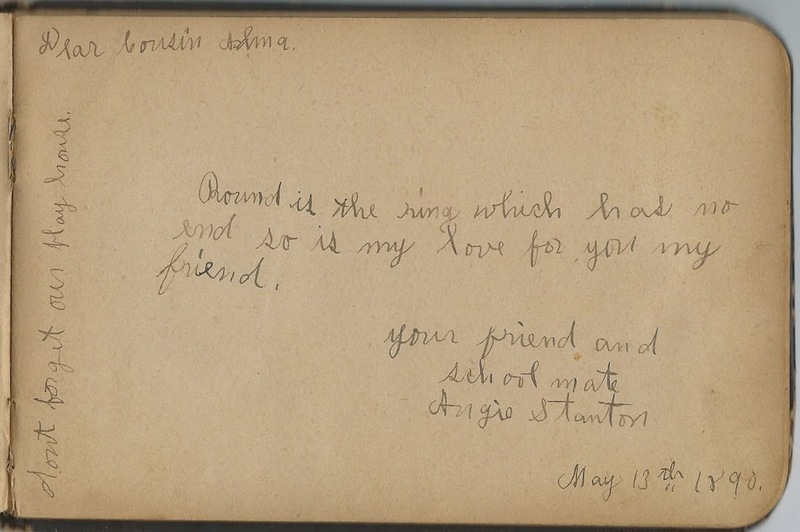 The album measures approximately 6" x 4" and contains the sentiments of 37 of Alma's relatives, friends, schoolmates and teacher. An alphabetical surname list and an alphabetical list of the signers, together with any personal information they offered, appear at the end of this post. Alma Vandy, or Vanderwarakin or Vander Workin, was born April 20, 1882 in New York, the daughter of Henry Vandy, or Vanderwarakin or Vander Workin, and Phoebe Ane (Waite) Vandy. Henry died when Alma was just a child. A newspaper notice implies that Henry left his wife and two children, Alma and her brother Justin Marcus Vandy, well off. 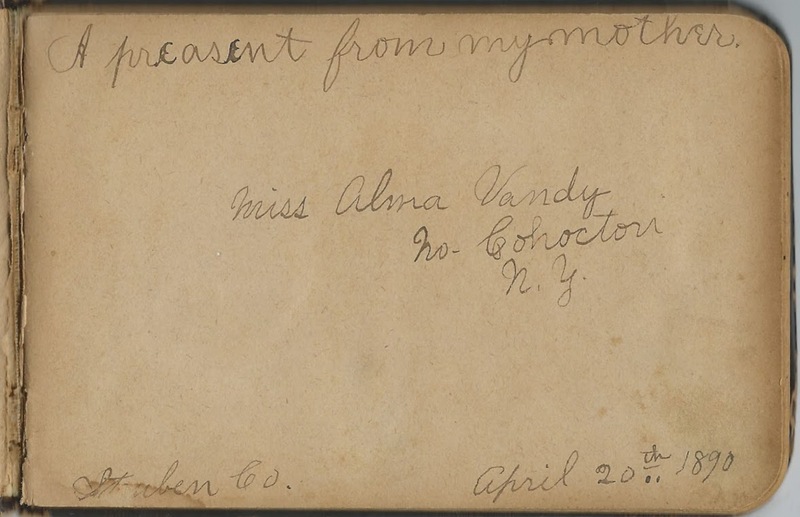 Alma's mother Phoebe Ann (Waite) Vandy inscribed a page in Alma's album on June 13, 1891. I believe by that time Phoebe had married her second husband, Beach S. Drake. Several of Alma's cousins inscribed pages in her album, and there may have been more who didn't express a relationship. 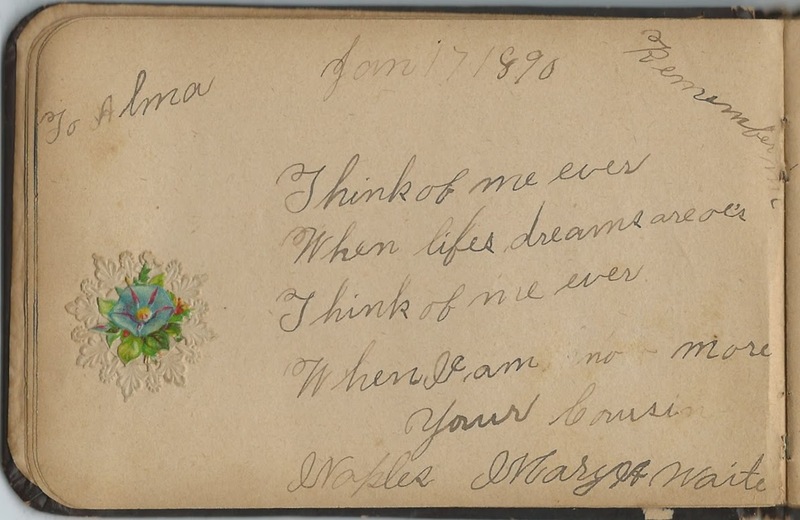 Cousin Mary A. Waite inscribed a page at Naples, New York, on January 17, 1890. She was the daughter of Gardner Waite, a brother of Alma's mother, Phoebe Ann (Waite) Vandy Drake. Cousin Angie Stanton inscribed a page on May 13, 1890. She also indicated that she was Alma's schoolmate. 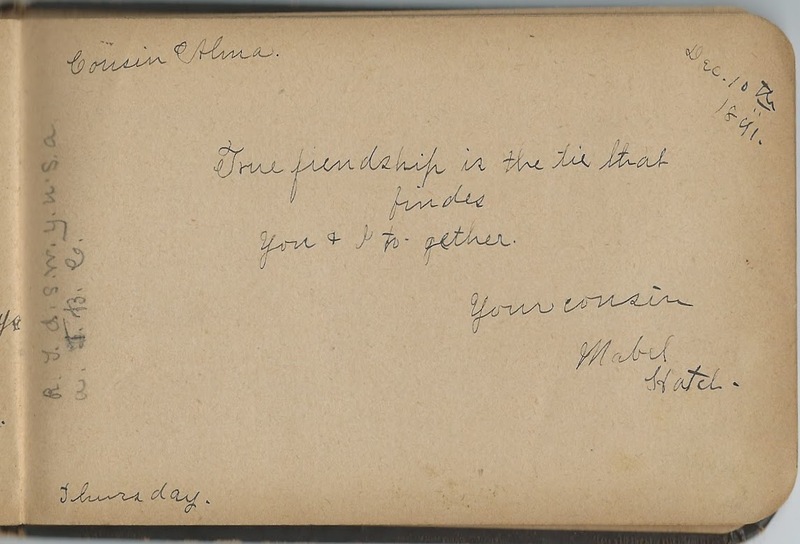 Cousin Mabel Hatch inscribed a page on December 10, 1891. 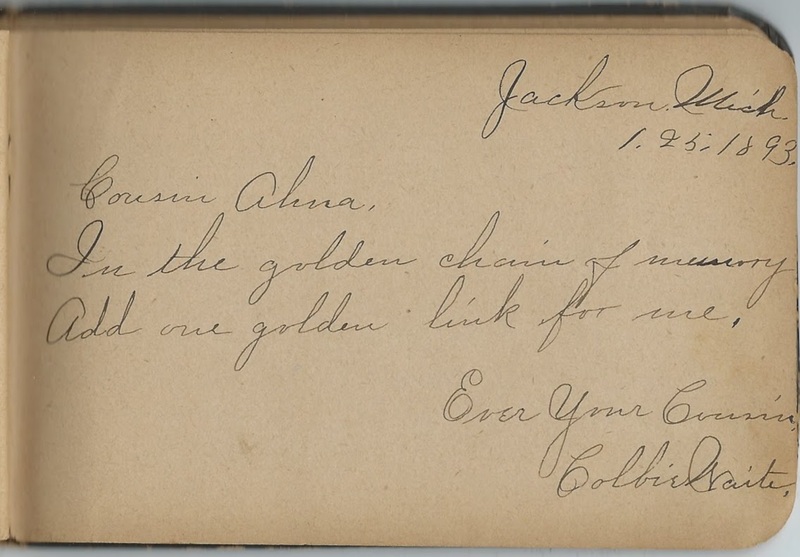 Alma's cousin Colbie Waite of Jackson, Michigan, inscribed a page on January 25, 1893. He was Colby Waite, son of Edwin Waite, who was a brother of Alma's mother Phoebe Ann (Waite) Vandy Drake. As noted above, many of the signers were Alma's schoolmates. 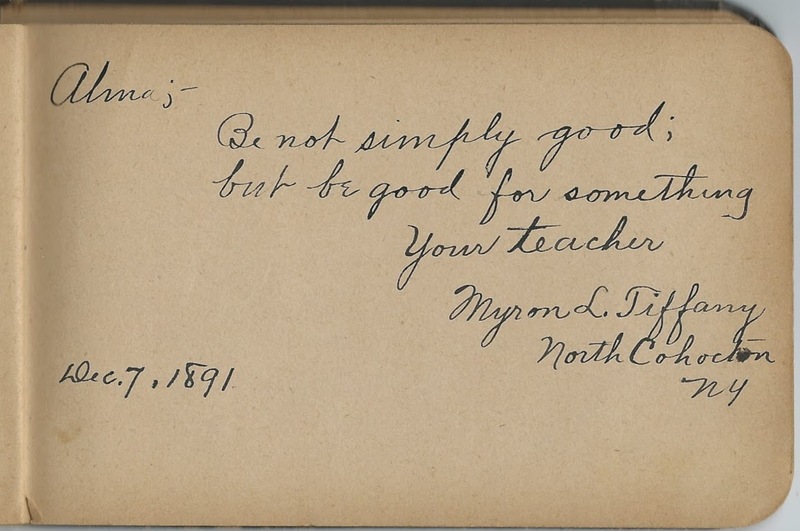 Their teacher, Myron L. Tiffany of North Cohocton, New York, inscribed a page on December 7, 1891. On April 13, 1904, Alma Vandy married Holly James Chapman, son of James Hiram Chapman and Susan M. (Graham) Chapman. Holly was born October 6, 1879. He and Alma settled at Cohocton, New York, and raised, I believe, four children. Holly died in 1976 and Alma in 1980. Caskey Hatch Polmanteer W ? Alma's mother, signed on June 13, 1891. She was Phoebe Ann (Waite) Vandy Drake. Henrietta Griesa of North Cohocton, New York; she signed as Henretta, but I believe she was Henrietta. Cora Haynes, signed on December 8, 1891; Alma's schoolmate. Mary A. Waite, signed at Naples, New York, on January 17, 1890. Alma's cousin, Mary A. Waite was the daughter of Julia and Gardner Waite, who was a brother to Alma's mother Phoebe Ann (Waite) Vandy Drake. Colbie Waite, signed at Jackson, Michigan, on January 25, 1893. Alma's cousin Colby Waite, son of Edwin Waite, who was a brother of Alma's mother Phoebe Ann (Waite) Vandy Drake.